“I have always relied on the kindness of strangers,” admits Blanche DuBois, an aging belle in Tennessee Williams’ classic play A Streetcar Named Desire. Blanche has had the props knocked from under her and has nowhere to turn except to her sister Stella, also living in reduced circumstances. In a far, far different context and definitely not because they have the slightest desire to do so, refugees from all over the world have been forced to rely on the kindness of strangers as they flee terrifying conditions in their homelands. Such has been the case of Sabah Jabri, who with her husband and children left bomb-scarred Baghdad, Iraq in 2007 with just identification documents and the clothes on their backs and fled to Syria, ironically back then a peaceful respite from warfare. After a year in Syria, the United Nations High Commission for Refugees assigned the family to emigrate again to Ephrata in the heart of Pennsylvania Dutch County. 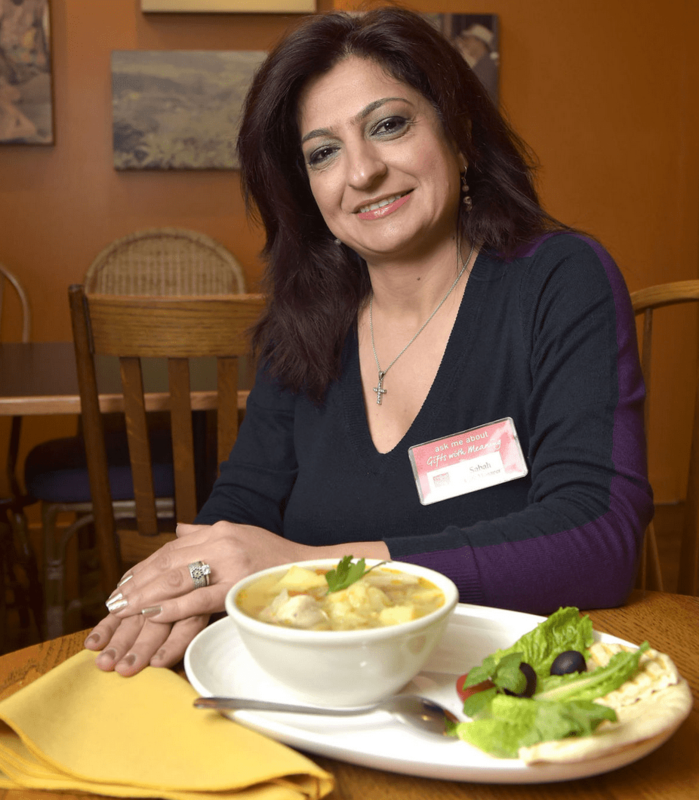 Currently, Sabah is manager of the Café at Ten Thousand Villages in Ephrata, where you can be sure this soup is on the menu. The article in Lancaster Online did not include the recipe (Of course not!) 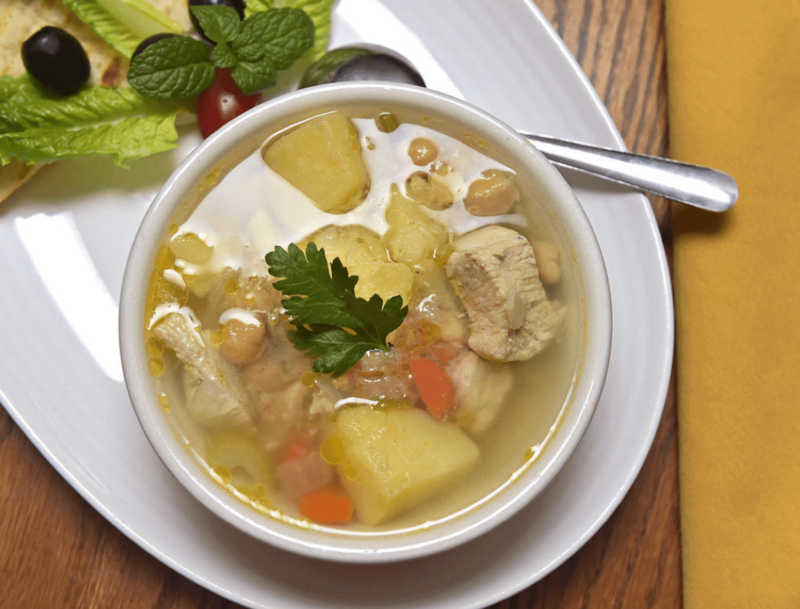 but the ingredients were listed: chunks of chicken breast, potatoes, carrots, onions and chickpeas in a hearty broth. Incidentally, Ten Thousand Villages in Ephrata offers fair trade items worldwide for sale. More than sixty years ago, a visionary named Edna Ruth Byler worked through the Mennonite Central Committee to begin an enterprise which has mushroomed into Ten Thousand Villages.
. . . [She] believed that she could provide sustainable economic opportunities for artisans in developing countries by creating a viable marketplace for their products in North America. She began a grassroots campaign among her family and friends in the United States by selling handcrafted products out of the trunk of her car. Byler made a concerted effort to educate her community about the lives of artisans around the world. Ten thousand Villages is the result, an undertaking that has grown well beyond the tiny house of its inception and offers for sale baskets, jewelry scarves, bags, kitchen & dining articles, toys and other items from artisans, particularly women, around the world. Mother also knew the nutritional heartiness of soup and often had vegetable soup waiting for us when we drove or flew up from Florida at Christmastime. Within five minutes of our arrival, one of us would fly into the kitchen and open the Frigidaire to see whether there was a ceramic pull-out drawer full of soup in the bottom left. Chicken corn soup was also her specialty, with hard-boiled eggs and rivels, doughy droplets made from flour . . . 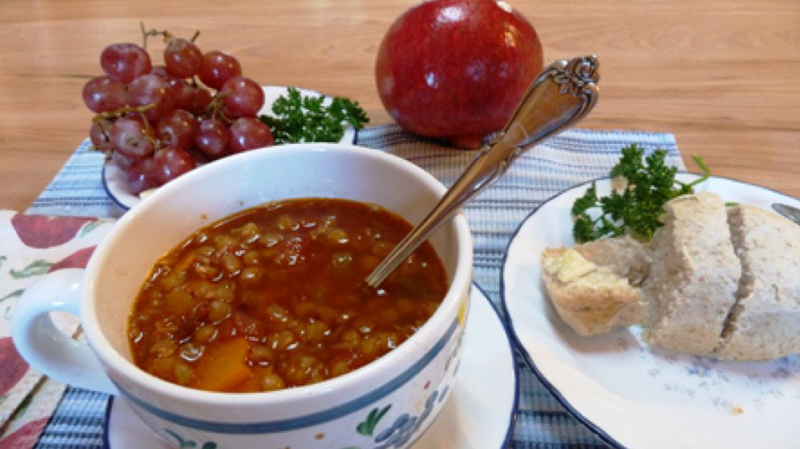 Author, editor, and cookbook writer Melodie Davis has recently featured savory Spanish lentil soup on her website where the recipe for the dish below appears. How has soup enhanced your life? Do you think Beethoven is right in the quote attributed to him? Do you have a choice recipe to share? Good morning, Marian. So much more than soup to talk about here! As you might remember, I have a special fondness for Blanche and and Streetcar, since my younger daughter was Blanche and her future husband was Stanley in their college production. I had no idea about the history of Ten Thousand Villages. I haven\’t been in one for a while, but now I will make a point to visit. I don\’t think the stores I\’ve been in have cafes. I\’m glad that Sabah and her family have found a home and a community that supports them. On to soups–I love soup! I made a white bean soup last week, and a black bean veggie chili yesterday. My mom used to make vegetable soups–usually a mixture of split peas and white beans. Other traditional soups include cabbage-beet borscht and matzoh ball soup for Passover. I always make a pumpkin-yellow split pea soup for Rosh Hashanah. And even though it is not winter-cold here in NJ, it is dark, damp, and dreary–perfect weather for soul-satisfying homemade soup. YUM! You jumped right into the soup today, Merril. Yes, I know you are very fond of soup as I recall posts with photos of you writing on the computer and in the background soup burbling on the stove and kitty cat for company. By the way, I\’m glad your daughter\’s marriage is turning out so much better than Blanche and Stanley\’s. As I recall, their wedding was a literary affair with a Jane Eyre theme. Stanley was actually married to Stella. Stanley and Blanche have another type of interaction– but when the show was going on, our daughter kept assuring us that this guy was really nice and nothing like Stanley. 🙂 Their wedding wasn\’t really a literary affair, but she and her bridesmaids carried fans with literary quotes, and hers was from Jane Eyre. If we ever get to the Ephrata store, I will let you know! I remember Edna Byler\’s visits to our Grandma Longenecker\’s house. On occasion Edna came bearing gifts for us from \”exotic\” countries she visited. Mark got wooden shoes from Holland and we girls received velvety slippers from India. Edna was scouting the world for items that could be sold here and a % of the profits would be returned to the producer of the items. What a trailblazer. 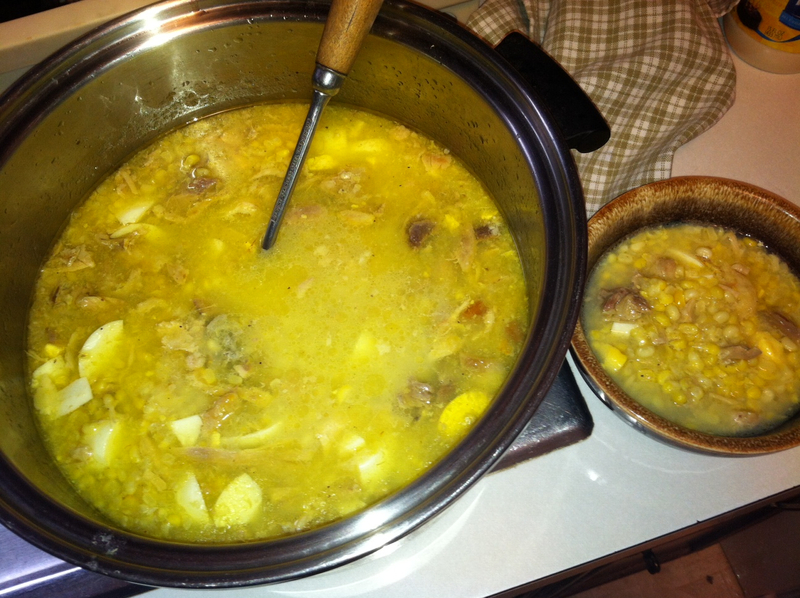 Ah, yes Mom\’s homemade chicken corn soup with riivels! Simply delicious. Mother I hope you are up there in The Kitchen happily making drawer fulls of soup. Edna exists in my memory as a petite and kindly-busy spirit. I know Grandma L who sewed oodles for MCC loved and admired her. Of course, the feeling was mutual. Somehow the clopping of the wooden shoes resonate with me more than the whisper of our moccasins. 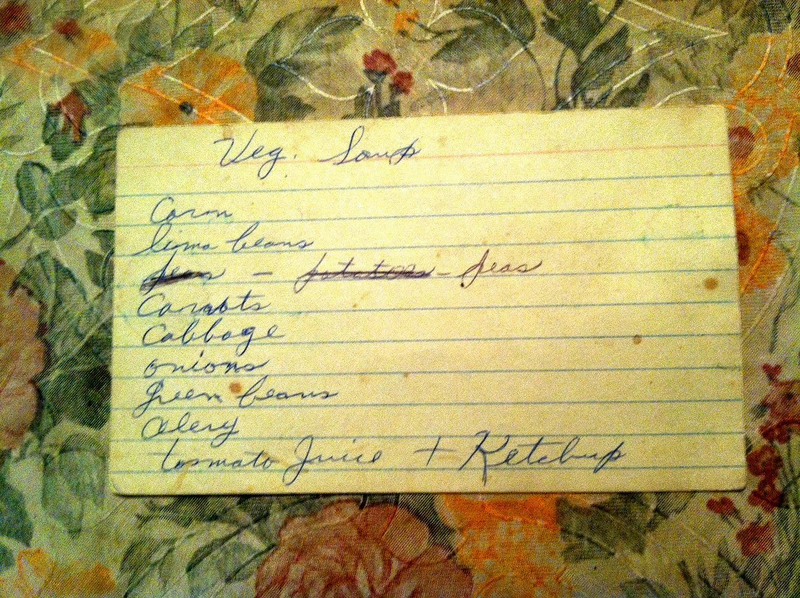 I know you miss Mom too, but she left behind a trail of memories including recipes. I love soup, especially the three squash soup at Whole Foods! I do make soup but usually I just put together what I have in the refrigerator or cupboard. Thanks for the history of Ten Thousand Villages–I shop occasionally at the store in Souderton, especially to get olive oil from Palestine, also Fair Trade coffee. Often I just browse the attractively displayed and colorful items, with a sample cup of the coffee of the day in my hand, and marvel at the creativity of the artisans. You have never been in a Ten Thousand Villages Store?? I suppose you have an excuse–a quick online check revealed that there is no TTV Store in all of Florida! But they do have a great online site which you can easily visit if you haven\’t done so already. The Ephrata store is a wonderful place to visit and savor the food at the Cafe. When we fly to PA our time is taken up with family business, but my crystal ball says I might have more time in the coming year to explore beyond Rheems and E-town. You have definitely whetted my appetite for the 10,000 Villages edible wares. I believe there is a link above to the online site. Thanks for adding to the conversation with your eyewitness report. So appreciated, Verna! You have never been in a Ten Thousand Villages Store?? I suppose you have an excuse–a quick online check revealed that there is no TTV Store in all of Florida! But they do have a great online site which you can easily visit if you haven’t done so already. The Ephrata store is a wonderful place to visit and savor the food at the Cafe. Moms corn chicken soup is the best. I\’m so happy that I made chicken corn soup with her the spring that I went to visit. I learn by doing I can\’t follow a recipe. My children love her soup. Now that it\’s nice and cold here we make soup for lunch. So hearty and soothing. I work a lot with refugees I love to hear their stories and to see their faces when they settle to new things. We are so blessed to encounter other culture\’s I believe it enhances our lives. Have a very Merry Christmas with your family. I miss Mother so much this season. Reliving memories here and seeing others like you join in helps assuage the grief. Wheaton, Illinois is one of the few place in the USA right now that has Christmas-y temps. But I think soup is extra savory right now anywhere you live because the days are so short. Like you, we eat dinner when it\’s dark outside. God bless you in your ministry with refugees. You are Jesus\’ hands and heart as you give that \”cup of cold water\” and more. Marian — The stories you shared and the soups you wrote about in today\’s post have warmed my heart, thank you. I can almost hear my mom\’s voice: \”You know it\’s good when it makes the sap run!\” (meaning…we\’d get runny noses when we ate (wolfed down!) her delicious homemade soups. You must have been the apple of your mom\’s eye. You both have that special wit. Thank you for warming my heart by showing up here each week often with an anecdote. I make soup much more often than I used to. Today my cabbage borscht will be especially good when I come in from shovelling my driveway for the second time! Lots of snow again today, in Winnipeg, Manitoba! I like your last quote about good manners not happening when you\’re eating soup! Elfrieda, I have a feeling you don\’t have to go to any gym to exercise your pectoral or biceps muscles shoveling snow. Most of the USA is enjoying balmy weather although some are longing for a white Christmas. Yes, that last quote is worth a chuckle – glad you liked it. And thank you for reading & commenting today from snowy Manitoba. I read this lovely post just after lunch — with all eight of us sitting around the same table. My son and I collaborated on the soup. We had earlier eaten part of a rotisserie chicken, deboned it, cooked the bones, skin, and fat to make broth. Then made some rotini, sauteéd celery and carrots, added back the chicken and all other ingredients and made a kind of chicken noodle soup. Quite tasty, even though the only seasoning we have here at our hotel is salt. The little children loved it and so did the adults. Merry Christmas to you and to all the refugees. Thank you for encouraging us to do our parts by sharing this story. I hear the excitement in your voice as you are savoring the fragrant aromas of cooking surrounded by the family round-up. Smart of you too to \”extend the table\” into several recipes. I\’d say that\’s so Mennonite of you, but other wise cooks do the same. I hadn\’t thought of Edna Beiler for decades, but her name popped up as I researched Sabah and her involvement in Ten Thousand Villages. I\’ll have to check out your link published before I knew anything about you – fancy that! Merry Christmas to all the Showalters! I love Ten Thousand villages and have done much of my Christmas shopping in the stores in Vancouver. I also enjoy making soup and will try the Spanish Lentil soup recipe. I was raised on Borscht so it is one of my all time favourites. Love the quotes! I hear you all the way from Spain unless you are back in Canada with friends and relatives for the Christmas season. I love how the cultures blend here, Spanish, Iraqi, Pennsylvania Deutch and possibly Russian from your forebears. (You did mention borscht!) Merry Christmas to the whole Foster family far and wide. We stayed in Spain as I had been back twice already and it gets costly. I don´t really like travelling at Christmas time. We did lots of Skyping so felt like I was with everyone. Thanks for the good wishes. Marian, your post evoked many memories. First, my first experiences with Ten Thousand Villages and Fair Trade products here in Portland. I would walk to their shop on my lunch hour, browse, often picking up gifts for others or buying something for us. Second, a trip several years ago was made by Bob\’s brother and his wife, along with us, to Pennsylvania. During our trip, we visited Ephrata, a trip back in time and faith. I purchased some lovely cross-stitch kits of the fracturs from the history of the Ephrata community. They now hang in our bedroom. What lovely memories and soup recipes for our winter table. It\’s embarrassing that I thought that Ten Thousand Villages was just a Pennsylvania phenomenon. I guess I\’ve been away too long. Regardless, dear Edna would be shocked and thrilled that her paltry beginnings in the trunk of her car has spread fair trade far and wide. The town of Ephrata is probably less than twenty miles from where I grew up. And I agree, fraktur art is lovely. I remember some of it being displayed during the 275th Metzler reunion in 2012. Thank you for commenting again. I remember fondly your first encouraging words right here on this website. Merci beaucoup, Sherrey. I hope the weather has settled down in Portland. Cliff and I both wish you a blessed Christmas and a healthy new year – with warm bowls of soup perhaps! I love soup. I made the potato soup tonight for Christmas Eve dinner. Lovely to see you here again, Athanasia. I know you are a good cook and love your family. Obviously you potato soup must have tasted the best ever. Merry Christmas to you yours! Have a joyous Christmas my friend . I always feel joy and hope when I read your comments. Joyous Christmas to you too, dear friend. There is something very homely and heartwarming about making and sharing soup. We loved our vermicelli soup as children and it was just wonderful when we were ill and couldn\’t manage to eat anything else. I still make it, as well as lentil soup and carrot and coriander for Christmas. As we are travelling at the moment, we have bought a jar of pumpkin soup for tomorrow! Soup warms up the heart and soul as well as the body! Merry Christmas to you too as you journey the \”on the road.\” I wonder where you are now. Soup has fragrance and enough fiber to fill up the tummy. I think that is what we are hoping for this season – warming up the empty spaces of our souls and hearts. Thank you for your hints about soup recipes here. And happy travels, safe and sound too. You surely do get around. I have to admire your adventurous spirit, Fatima. Happy New Year to you too! Sorry it took me a while to get here! But thanks for the shout out and the story which reminds me of many who have come to our Clothes Closet over the years. I wonder how many remember when Ten Thousand Villages was Self Help Crafts? I remember going to Edna Beiler\’s basement in Lancaster Co, if only I had taken a picture then, back when I was at EMC. When our children were in high school, Aunt Ruthie marked their graduation with a gift from Self Help. Our two got large wooden elephants from Thailand which Cliff inscribed with their names and the insignia of their institution. I think I can post only URLs here, so I\’ll share the photo on Facebook. Sometimes I suffer from the \”if-onlies\” too, usually an exercise in futility. We both have plenty of visual artifacts to pass on. Merry Christmas to you and the entire Miller/Davis clan! What a beautiful Christmas post…and reminder of both the kindness of strangers and the goodness of strangers needing kindness. Well done, Marian. Thank you. You are welcome, Marylin. I just finished reading your comment on Shirley Showalter\’s website. Amazing! Families are not always kind to one another, but yours reveals love through and through with the memories of five children woven into the fabric of thirteen grand-children\’s lives. I can\’t think of a better way to describe wholeheartedness. A \”souper\” solution for sure. Merry Christmas to you and the entire Warner clan! Wonderful post Marian. And thanks for sharing some of the recipes. I love soup, would eat it every day if I had a choice. And I love the quotes, especially the one about eating soup without making noise. Well that\’s half the fun! 🙂 Merry Christmas! Usually I associate soup dishes with cooler weather. As you may know, most of the States are unseasonably warm for soup at the moment, not that the weather has to be cold for soup. However, I checked the temps in Toronto for Christmas day – 30s and 40s sound perfect! And of course you may slurp your soup, Debby! I\’m just getting to my reply after the fanfare of brunch homemade by Cliff and me + gift exchange. Bagels and fruit salad were the easiest part. I had never heard of Edna Ruth Byler, the origin of Ten Thousand Villages, and the deep connection with Mennonite community. A wonderful tale to tell, Marian, a story about the wisdom and kindness of tolerance. And thank you for photos, recipes, and general good vibes and loving energy. Nothing like soup to make me feel loved. We are both honoring the heartiness of soup this week. I just posted your link here to my Facebook page. Hope, wisdom, and soup – words we can carry into 2016. What a lovely story. And as for soup – yes please! Vegetarian variety! I know you are \”souper\” busy just now. Thank you for taking the time to read and comment here. There are so many vegetarian recipes available . Besides, most recipes can be adapted to exclude meat. Family always comes first. I\’m tickled that you even took time to comment even now given the sick family member and other holiday demands. Thank you, Susan. I\’ve heard of chicken soup as a \”treatment\” for what ails you, but never heard it referred to as Jewish antibiotics. Ha! Thanks for the reminder about barley coup. I can just see that spoon standing straight up in the bowl. Also good for what ails you! Reblogged this on Lisa Mari Egra. Thank you so much for the re-blog, Lisa Mari. From your website, I can tell you appreciate that which warms the body and soul. Thanks again! Here I am, late again, Marian but what a yummy post. Soup is a favorite of mine. My best soup story has to do with Wayne\’s mom who nurtured me with her homemade chicken-vegetable soup while I was undergoing chemotherapy At the time I had no appetite or taste due to the drugs but the warm soup felt so good going down and I could almost even taste it. She\’s been gone for about 15 years but I can still\”taste\” her wonderful soup laced with TLC.Thank you for all the recipes. You appeared – who cares when? Not me. Besides, it\’s Christmas week and family comes first. God knew when to supply soup in your life. Wayne\’s mom is a case in point. I\’m glad you enjoyed the recipes. Soon you\’ll be snowed in (maybe), weather will turn cooler in Jacksonville, and we\’ll be warm and toasty with yummy soup. Thank you for appearing and adding your flavor to the conversation, Kathy. Bless you, my dear!